Hearthstone's "Curse of Naxxramas" expansion wraps up with the Frostwyrm Lair, home to two of the toughest bosses of the entire set. If you're having trouble getting that special card back, we can help. Hearthsone "Curse of Naxxramas" has opened up its fifth and final wing, the Frostwyrm Lair. This one includes only two new bosses to defeat instead of the usual three, but they're among the most challenging so far. Heroic Mode makes them downright unfair, with absurd abilities that will make even seasoned veterans struggle. Here's how to fend off the two remaining bosses in Heroic Mode to earn your snazzy new Heroic Naxx card back. In the Normal mode, Sapphiron is a neat little combat puzzle revolving around card placement. As long as you carefully place your minions around the Frozen Champion, you can breeze your way around its Hero Ability. In Heroic, though, there is no convenient block of ice to hide behind. It's just you and a beast that wipes your side of the board every single time. On top of that, it has a very cost-efficient "Pure Cold" spell that deals 8 damage to you for only 5 mana. This might seem to lend itself to a rush deck with heavy use of Charge abilities, but the high health means it's difficult to find a combination of Charge minions that can deal enough damage to finish it off. Instead, the best decks for the job are built around controlling Sapph's side of the board and chipping away at the health meter. You can accomplish this any number of ways. A control Mage with heavy use of Freeze spells can work, but the use of Spectral Knights makes any spell-reliant deck a bit touch-and-go. A Hunter is the best way to go for a deck with mostly common cards. You can use traps like Freezing and Explosive to keep his minions at bay, and a Misdirect to force them to do damage to each other. Your Eaglehorn Bow will keep earning more durability as it triggers traps, and the Mad Scientist is a good way to get the secrets out for free. You can also make liberal use of cards that benefit you when they're killed, like the Nerubian Egg. Make sure you pack some Kill Commands too, for when a secret isn't handy. 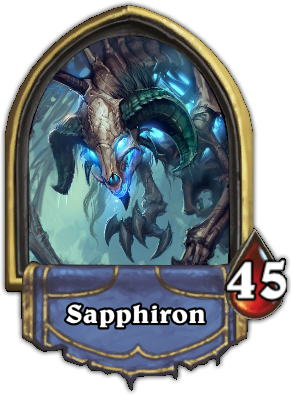 Near the end you'll probably have run through your secrets and Kill Commands, and Sapphiron will have enough mana to summon lots of minions. At this point, break out your Timber Wolf and Unleash the Hounds combo for just 4 mana and hit Sapphiron in the face. If any of the opposing minions pose a fatal threat, hit it with a Hunter's Mark and use one of your dogs to kill it. If you have them, a finishing burst like Leeroy Jenkins or King Krush can be handy to finish the fight. If you've been itching for that sweet card back, it all comes down to this. Kel'Thuzad is one of the toughest bosses in all of Naxxramas, which is fitting enough given that he's been mocking you the whole time. Like any good final RPG boss, he comes with in two phases. In the first phase, he'll automatically hit you for three damage every turn, with a freeze effect that will prevent you from using weapons. Once you break his armor, or anytime after turn 8, he'll cut off your turn immediately and summon two 5/5 minions with Taunt. At this point his Hero Ability switches to its second phase, in which he takes control of a random minion. All the while he'll be playing heavy-hitters, Deathrattle-powered Taunts, and Spectral Knights. The constant 3 damage will mean you're on a ticking clock, so you'll want to pack some healing spells to mitigate the damage. You'll also need Taunts of your own to keep the enemy minions at bay. Paladin and Priest have the best healing abilities. Similar to Grobbulus from the Construct Quarter, your best bet is to use a Priest to buff a minion with Divine Spirits and Inner Fire. You can use a cheap Taunt minion like Deathlord or Mogu'shan Warden, or better yet, buff up your Stoneskin Gargoyle and grant him Taunt. Defender of Argus works if you want a little extra health, but Sunfury Protector is even better for the cheaper mana cost since the relatively small stat boost will be a moot point. You'll also want a Lightwell to keep yourself healthy, and combined with a Northshire Cleric it can be invaluable to drawing the cards you need quickly. Just be sure to sacrifice the Cleric once the job is done, because otherwise you run the risk of reaching deep into your deck too fast and suffering Fatigue damage. A good deal of this will rely on luck. You need to make sure you have the tools in place within the first few turns, or Kel'Thuzad will kill the minions before you can buff them and just generally make you suffer. If you don't have at least one of your tools out by turn three, you might want to concede and start over. 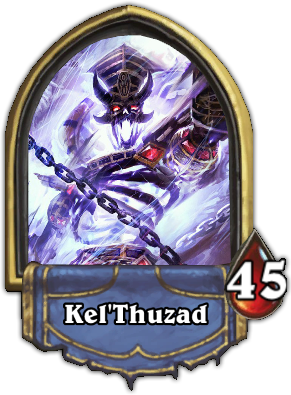 Once you've triggered the second phase, Kel'Thuzad will likely be pretty envious of your overpowered minion and try to steal it away. Make sure you always have a few other minions on the board so his randomized effect might hit a scrub instead. As long as you can get his health into the danger zone, you can finish him off with a spell like Holy Fire. It doesn't hurt to keep a Mind Control around too, just in case you need to steal your bruiser back. Alternately, you could keep a Silence around to undo the buffs you gave it, in case you can't get it back. Steve Watts posted a new article, How to finish Hearthsone's Heroic 'Frostworm Lair'.